After cooking out with the folks, we headed down to the studio. The kiln was finally cool enough to open. We were met with some shiny hot pots. The results were really good. The glazes I’d worked with at Double Diamond Pottery worked as expected and produced great results. The Crystal Blue/Green from Fat Cat Pottery worked exactly as I’m used to, especially when dipped in glossy white for accents. That made me happy. The new Amaco Potters Choice Rutile Blue turned out really nicely. It looks a bit like faded old denim in some cases. I was also really pleased with the way the Standard Ceramics #112 fired. It behaved a lot like the Highwater speckled brown stone that I’ve been using for the past 3 years. Again, a happy result. Once we unloaded the kiln and spent some time finding the special touches in each piece’s glaze, I loaded the kiln with the rest of the glazed ware for a second small firing, which ended up being only a little more than half full. They should be finished tomorrow mid-morning. More photos and notes about test glazes and combinations once the whole set is complete. So, it’s official! 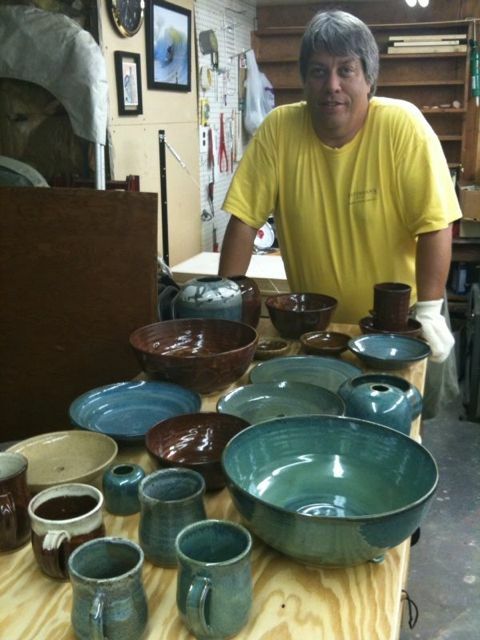 Barley Hollow Pottery produces pottery. It took over 7 months, but it’s a nice shop and good place to work. Now, I just have to make the pottery. It’s about time.